Evidence of Chemical Reactions-Watch It! In this activity students will use a QR code reader to access 6 videos. Each video students will view shows a chemical reaction. 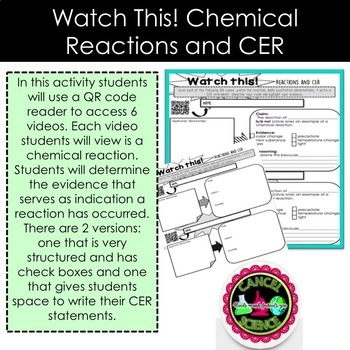 Students will watch the video and make qualitative observations, then determine the evidence that serves as an indication a reaction has occurred. 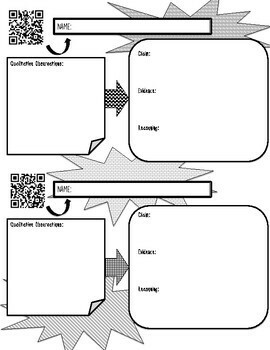 There are 2 versions of this video web quest: one that is very structured and has check boxes and one that gives students space to write their own CER statements. 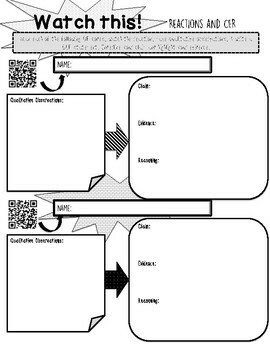 These worksheets can be printed off in booklet format and students will still have enough space to write.